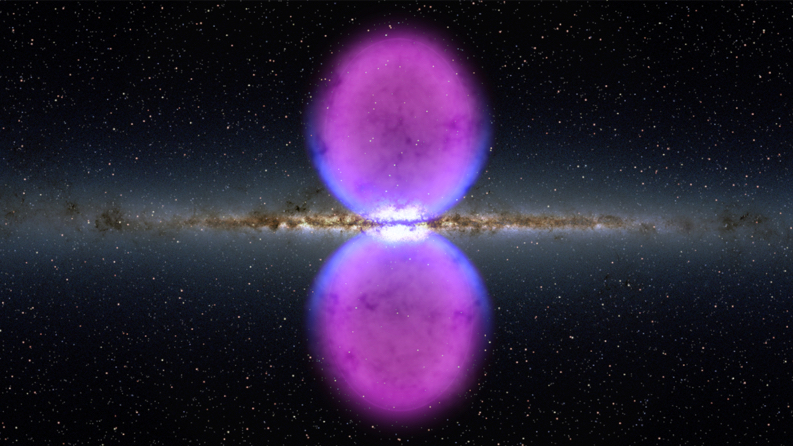 Continuum diffuse gamma-ray emission is produced in our Galaxy by interactions of high-energy cosmic rays (CRs) with interstellar matter and low-energy radiation fields. A weaker diffuse component is observed with almost isotropic distribution over the sky, and thus is thought to be extragalactic in origin. 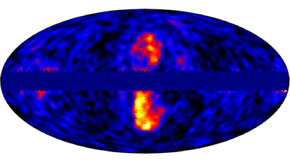 This emission is usually referred to as the extragalactic gamma-ray background (EGB). The great majority of the EGB can be attributed to unresolved populations of extragalactic gamma-ray sources, primarily the nuclei of active galaxies called blazars. Measurements by the Fermi Large Area Telescope (LAT) have shown that the basic production processes for interstellar Galactic emission are understood, and the high statistics and relatively good angular resolution of the LAT observations have simulated refinement of these models. Such models are fundamental both for studying gamma-ray sources and fainter diffuse components (like the EGB) and for understanding the interstellar environment and distribution of CRs of the Galaxy. Interstellar emission traces the density of CRs throughout the Galaxy. 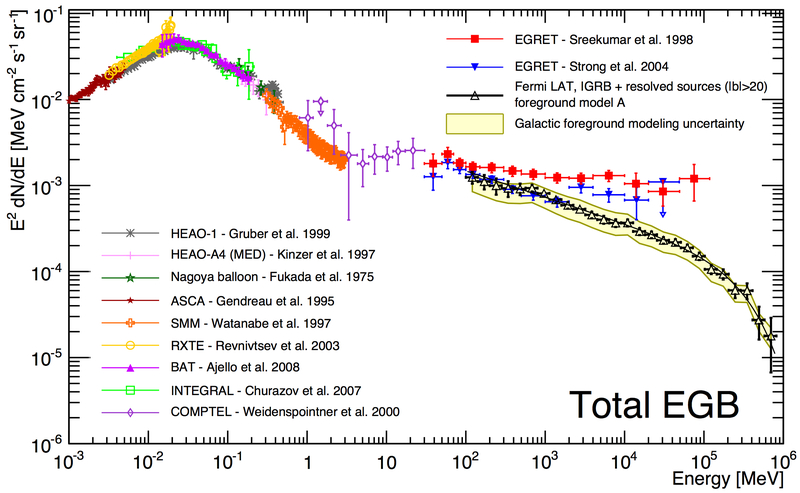 One of the unexpected findings by the LAT is the indication of CR densities larger than predicted in the outer Galaxy. The excess CR density might be due to a a broad 'halo' of CRs in the Milky Way, promoting diffusion of CRs into the outer Galaxy, i.e., the part of the Milky Way more distant than the Sun from the Galactic center, or to non-uniform diffusion or convection processes. Alternatively, this excess may be due to emission models that have underestimated the amount of gas present in these regions. The measurements by the LAT led to changes in our understanding of the interstellar medium. Most of the mass of the interstellar medium is in neutral gas, predominantly hydrogen in atomic and molecular forms. Atomic hydrogen can be observed directly at interstellar conditions, from its 21-cm radio spectral line, but molecular hydrogen generally cannot. A microwave transition of the CO molecule has been widely used as a surrogate for molecular hydrogen. Perhaps not surprisingly, the need to assume a relation between CO line strength and molecular column density, and other assumptions related to deriving atomic column densities from the 21-cm line, have meant that the gas content of the interstellar medium is not perfectly characterized. 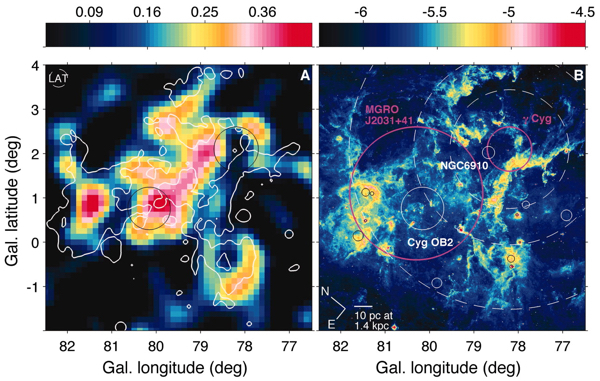 A semi-independent tracer of interstellar gas, infrared emission from cold dust mixed with the gas, is now widely used to trace gas missing from the hydrogen and CO line observations. 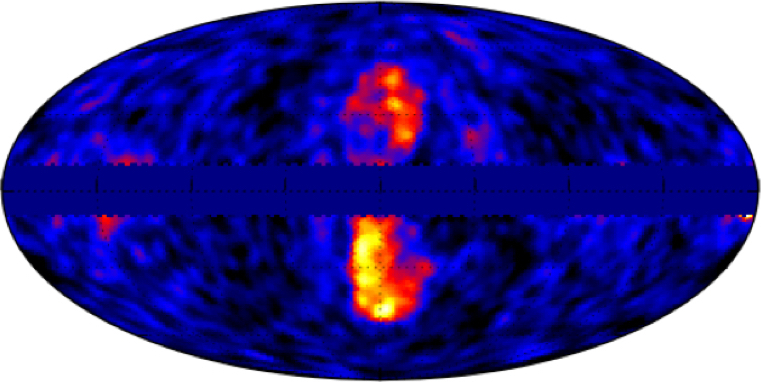 This new component, referred to as 'dark gas', has proven to be essential to account for in accurate models of the diffuse gamma-ray emission observed by the LAT.